plus any custom data you wish. Create any number of reporting segments. Reporting is 100% realtime with no sampling. Reports are fully customizable. Create your own dashboards. Session-level data from the beginning of your account is accessible at anytime via the website or API. Get email delivery of reports. Schedule exports on any timeframe. With our proprietary technology, we detect suspicious and hidden sessions by all your sources and report on the quality factors. Quit paying for useless traffic. Use our REST API to get full user profiles with quality scores and demographics in realtime to make better decisions about how to engage your users. See how your known users engage, even across devices. Track custom events and attributes on profiles. Integrate people profiles into your existing systems. 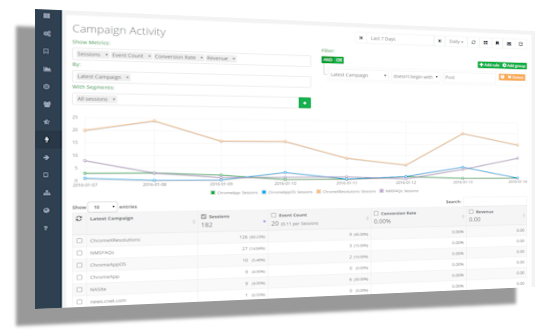 Full campaign, conversion and revenue analysis. Includes funnel analysis and attribution. Eliminate sources that don't convert. Events can have any amount of data attached and can be updated at any time. Reports can be customized to display event attributes. Integrate and customize using our platform. And with our open source website, you can build your own custom product using our data platform. "Gator.IO is the data platform we chose for our credit card fraud detection software. It tracks detailed data on users, including bot detection. Now, we can focus on what we do best." "The time and expense of developing and maintaining our own data platform was too much for us, so we partnered with Gator.IO and have reduced our time to market dramatically." "We have integrated the extra capabilities we found in Gator.IO into our web analytics product, Hitslink.com. This provides incredible extra value to our thousands of customers." 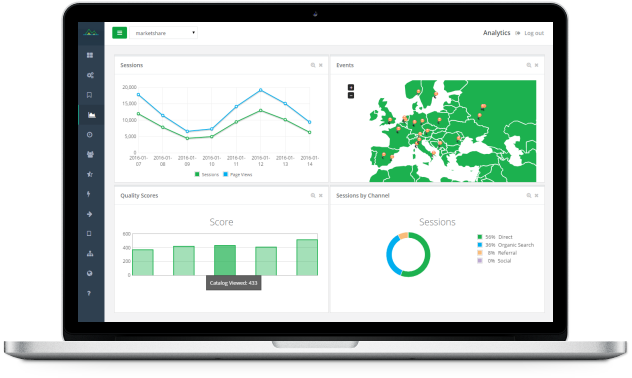 Measure analytics across your network. Protect your reputation by filtering out bots. Personalize ads and content based on realtime user information. Get deep insights into your campaigns. Perform historical segmentation based on any criteria. Get funnel and attribution analysis. Optimize engagement on your real users, not bots. Track events on any user action, including ecommerce data. Collect people analytics across devices. Pricing is based on how many calls are made into our platform. This is the total of events, sessions, page views, and API calls. Based on total sessions, events, page views and API calls per month (hits). Pricing includes phone and email support and unlimited people profiles. Bulk pricing is available. Contact us for more information.